I took a vacation to Monterey to photograph Southern sea otters and was so lucky to watch, from a close distance, a male and female in courtship. I hope my photographs have captured their playfulness with one another and their ability to eat and eat! An otter may hunt on the seafloor, but always returns to the surface to eat. Floating there on its back, it uses its chest as a table. To help it stay warm in cold water, a sea otter burns calories at nearly three times the rate you do. An otter fuels its fast metabolism by eating up to a quarter of its weight in food a day. (A 150-pound person would have to eat 35-40 pounds of food a day to match that!) An otter’s coat has pockets—flaps of skin under each front leg, which it uses to stash prey during a dive; leaving its paws free to hunt some more. Sea Otters once thrived from Baja California to the Pacific Northwest of North America through Alaskan and Russian waters and into Japan before hunters nearly exterminated them in the 1700s and 1800s. The California population has grown from a group of about 50 survivors off Big Sur in 1938 to just over 2000 today. 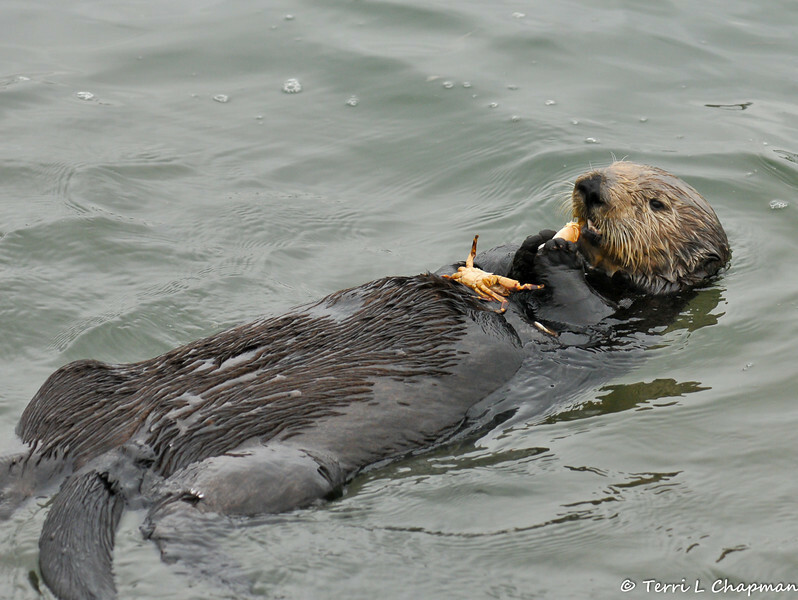 Although their numbers have increased, sea otters still face serious risks.